Abbey Road — Tribute to the Beatles is a flawless note-for-note recreation of the Fab Four that includes custom-tailored costumes, vintage instruments, Liverpudlian dialect and precise attention to every detail. As a result, Abbey Road Tribute to the Beatles is considered one of the most musically and visually satisfying Beatle tribute acts in the world that recreates the magic, music, wit and charm of the Beatles, including John, Paul, George and Ringo’s cheeky personalities, familiar onstage banter and patter between songs. Along with the three costume changes (including authentic early black Beatle suits, Sgt. 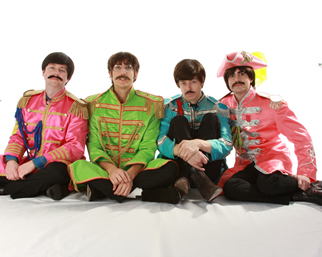 Pepper’s regalia and Abbey Road attire, fans will other elements that other bands miss, such as the piccolo trumpet solo on Penny Lane and the full orchestration of A Day in the Life. Creedence Relived is a highly faithful tribute and an accurate recreation of a CCR concert of the 1960s. With their tight harmonies, flawless note for note renditions of Beatles hits, custom–tailored costumes, vintage instruments, Liverpudlian dialect and precise attention to every detail, Abbey Road – Tribute to the Beatles has honed their show to become one of the most musically and visually satisfying Beatle tribute acts in the world. Abbey Road recreates the magic, music, wit and charm of the Beatles, including the Fab Four’s cheeky personalities, familiar onstage banter and patter between songs. The band headlined Beatles Festival 2010 in August 2010.